Cookies...yum, they're one of my favorite indulgences. I had the pleasure of sampling some delicious ones from Eleni's new "crisp" line. They're all tasty but my favorites are the Oatmeal Choco-Chip and Ginger Snappy - the former because of its softness and chewiness and the latter because of its spicy flavoring and nice crunch. 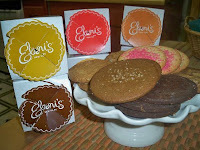 Although Eleni's is sold in Manhattan, the cookies are produced in our neighboring 'hood, Long Island City. If you'd like to try them, I have a 15% off coupon that I'd be happy to extend to all my readers. Email me at critic@foodistanyc.com if you'd like one. These cookies are lovely to enjoy if you have guests over or if you just want to munch on something sweet and comforting.